Living Darling | The ingredients for a darling life: Great food, adventures, beautiful spaces, creative endeavors that enrich the soul, and cherished moments with family and friends. 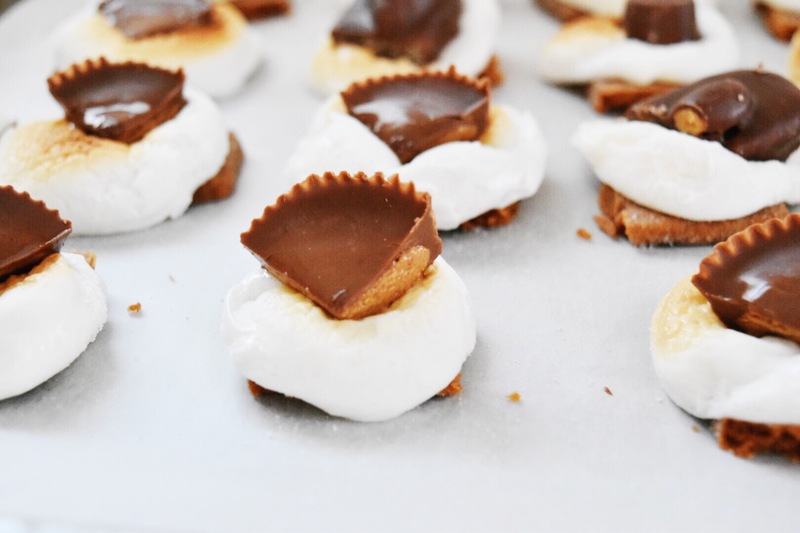 S’more bites are a super quick treat to make and the perfect way to use up that Halloween candy. 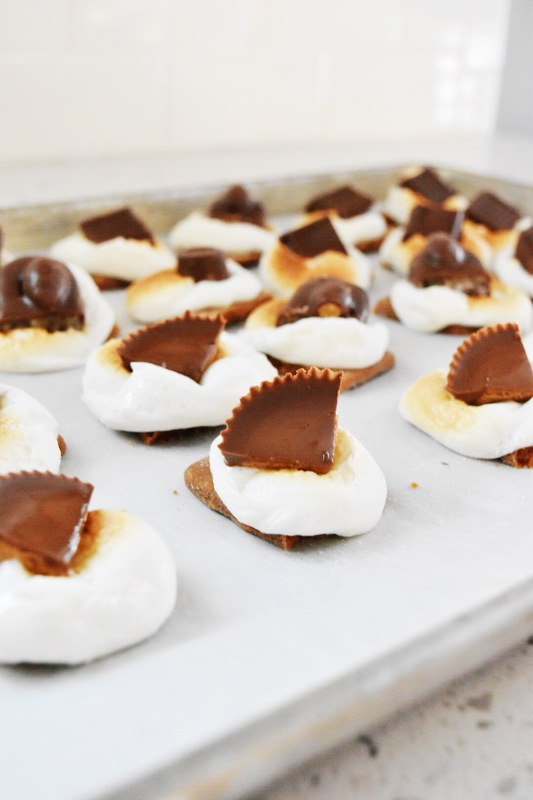 These are also a great treat to bring to a Halloween party. 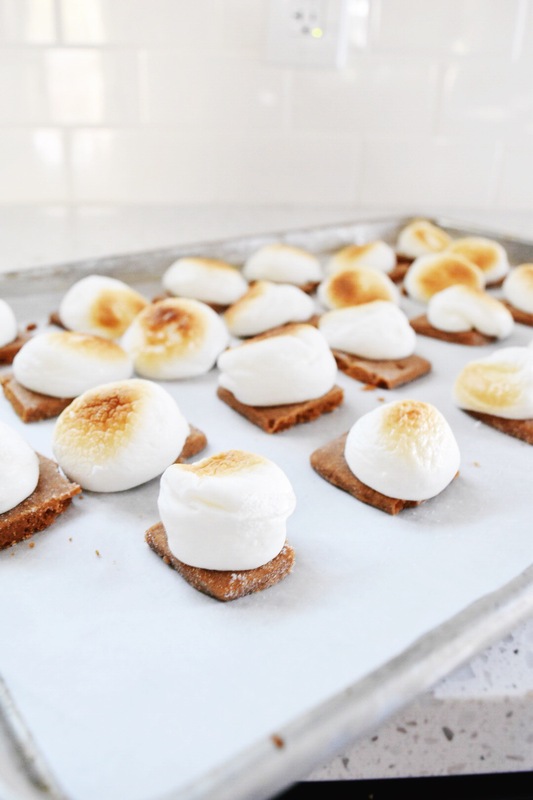 What sets these s’more bites apart is the gourmet graham crackers I get from the Tulie bakery here in Salt Lake City, Utah. A world of difference in the taste and texture department! Each cracker is about 3 inches square so I quartered them. 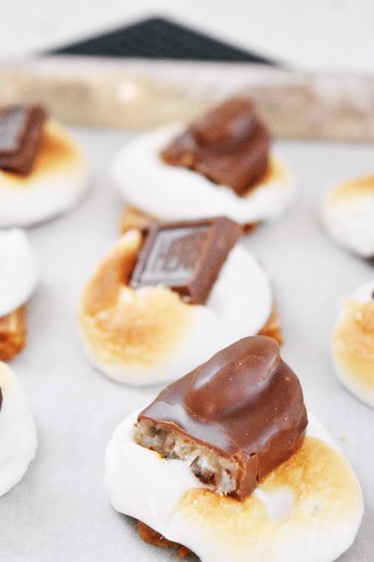 Making each bite perfect for one marshmallow. I then cut up an assortment of candy into smaller pieces. 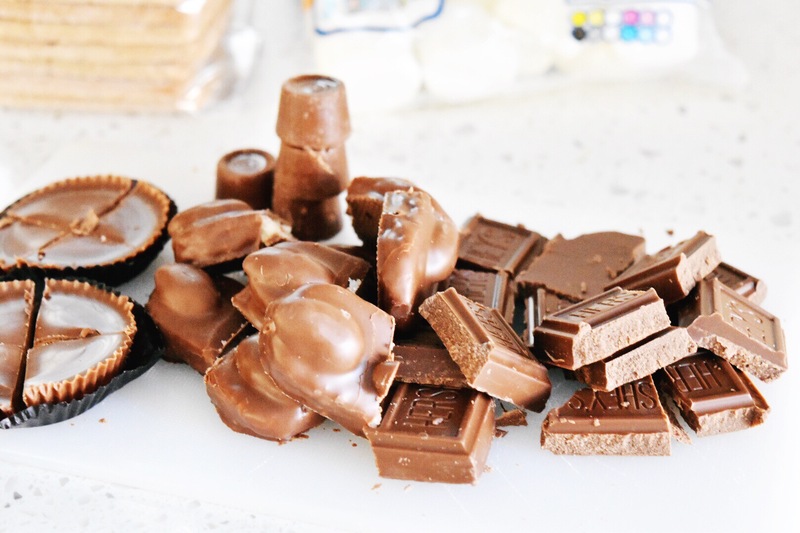 My favorite topping is Almond Joys. You don’t need a fancy torch, I just lined a baking sheet with parchment, added the crackers and marshmallows, and toasted them in my over on broil. It took about 3-5 minutes to get a nice golden top. 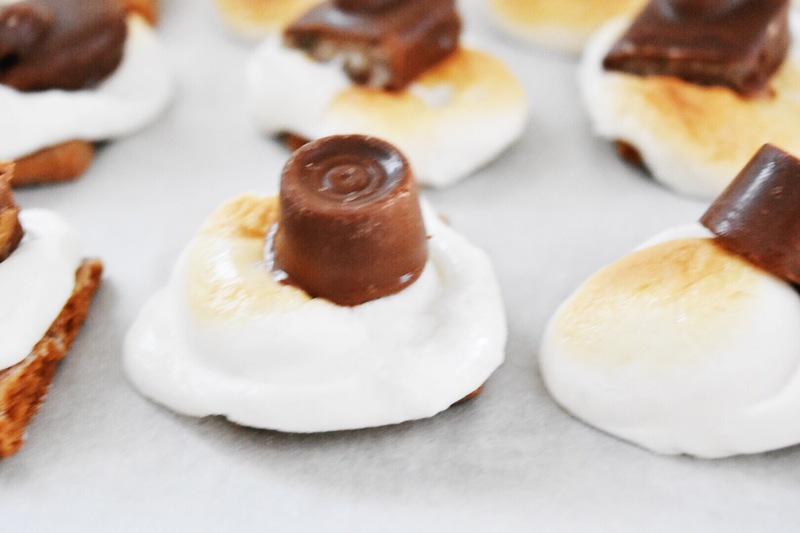 Press the candy down into the marshmallow being sure to get it down in the gooey melty part! You can serve these warm or cool like I did last night. I let them cool down for a few minutes, added a lid and took them to a party. 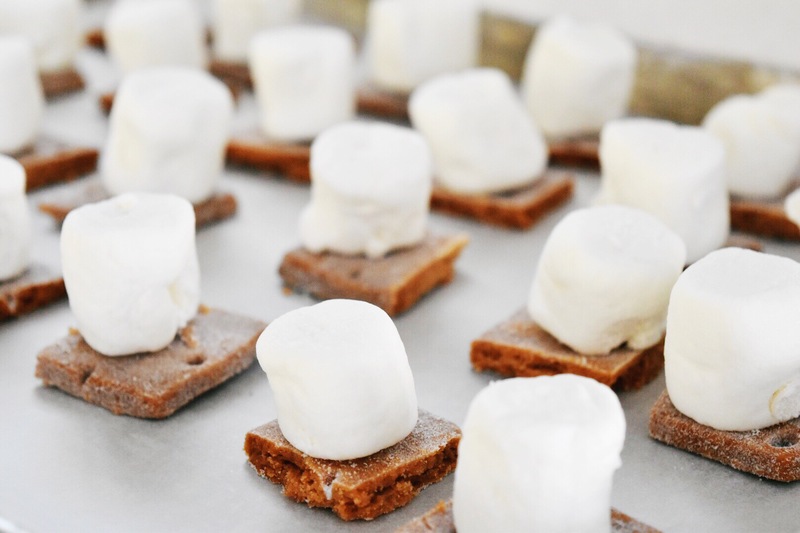 Leave a comment with your favorite S’more topping or where to find gourmet graham crackers in your area. 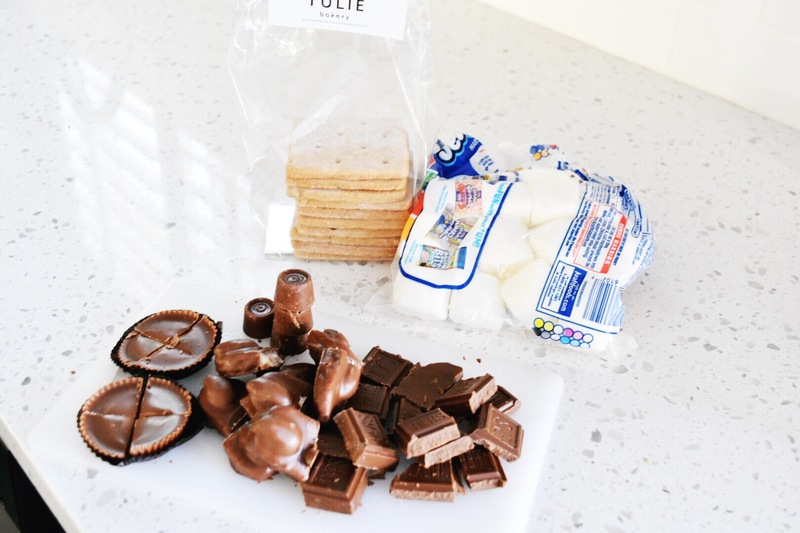 This entry was posted in Wanna Be Foodie and tagged halloween candy, halloween treat, s'more bites, sweet tooth on October 31, 2016 by Sarah. A little over a week ago our two escape artists Shawshanked their way out of our backyard while we were away from home. Which lead me to briefly question why they would ever want to leave our little piece of paradise? Seriously, they live with two full-time “crumb monsters” a.k.a. my hubby and toddler, who leave a trail of delicious crumbs wherever they go. They have a big yard to try to destroy on the daily, dog beds at every turn. But I digress. Luckily our neighbor saw them running the streets, lured them back into our backyard and secured our gate. So I added “do something nice for your neighbor” to my to-do list. Then our friend Janell helped us out with our dogs on our last day of vacation and I again pondered what to do to say thank you. I thought about baking human treats for both, but since I’m not familiar with my neighbors food preferences, the last thing I wanted to do was show up at her door with a dozen cookies only to find out she is diabetic or has a gluten allergy. That is when it became obvious that I need to make doggie treats! It was a perfect solution since they both have dogs, and while my own dogs haven’t exactly written up terms for surrender like better food, I figured a few yummy pupcakes might just keep them from trying to escape. In the words of Michael Scott, it’s a WIN, WIN, WIN scenario. I found this great recipe on The Happy Foodie by Martha Stewart for Peanut Butter and Banana dog cupcakes but I decided to improve it immensely with one simple addition; bacon. Your pups will thank you. If you would prefer to weigh out your flour and oats into grams you can use the recipe above but I doubled the batch and converted the recipe to the U.S. Cups. This recipe makes quite a few pupcakes so freeze what you cant use in the next 2 weeks or they make a great gift for your fellow dog lovers. In a medium bowl, mash ripe bananas, add honey and eggs, stir until combined. Add rolled oats, flour and baking powder, stir until combined. Add water and stir gently till combined. Fill mini cupcake liners 2/3 full and bake at 350 degrees for 10-12 minutes. Let cool completely. Store in air-tight container and refrigerate for up to 14 days. I hope your fur babies love this treat as much as mine did. This entry was posted in D.I.Y., D.I.Y. & Honey Do, Wanna Be Foodie and tagged best dog treat recipe, dog cupcakes, dog treat recipe, dog treats, easy dog treat recipe, fur babies, furry family, neighbor gifts, pupcakes, shawshanked, thank you gifts on August 10, 2016 by Sarah. I have been in love with Shirley Temples since the first time my dad ordered me one when I was a little girl. Maybe my 35th birthday had me subconsciously reaching for something that made me feel young. Yet every time I thought of a Shirley Temple , I found myself wanting to “adult” it up a bit with vodka. Maybe I’m finally ok with getting older, emphasis on maybe. When planning my birthday party I found several great recipes for a dirty shirley but most of them required way too much effort for this working momma. I wanted to try out my own recipe but all I had at home was a can of lemon Sanpellegrino and didn’t want to run to the store for 7-up. Man I am glad I stayed home. The bite of tart lemon really compliments the sweet grenadine and fruity vodka. This drink is crazy refreshing. I hope you love this recipe like I do. Fill 16 oz cup half way with ice, squeeze the juice from 1 quarter lemon and lime over ice, add vodka, add lemon soda, add a splash or two of grenadine syrup, garnish with maraschino cherry. This entry was posted in Adult Party, Drinks, Let's Party, Sweet, Wanna Be Foodie and tagged cherry, cocktails, dirty shirley, flamingo party, grenadine, lemon, maraschino, shirley temple, summer drink recipe, vodka on July 21, 2016 by Sarah. In honor of my birthday week I though I’d share my 35th birthday party inspiration; a Tropical Flamingo party. In 2008, Felipe was kidnapped and held for ransom. I unfortunately never saw him again. But his memory lives on in my heart. Here is what you need to throw a fabulous tropical Flamingo party. Start with a whole flock of flamingos. But not just any flamingos, go with the original Don Featherstone flamingos, they have the best details. I finally decided to try my hand at a balloon arch after drooling over several amazing arches on The House That Lars Built. You can check out the one pictured above on Wedding Chick or there is a great tutorial on A Beautiful Mess. I am in love with this tropical flower backdrop on Blitsy. Perfect for a D.I.Y photo booth. Top the decor off with a pineapple flower centerpiece. I have loved Shirley Temples since I was a little girl but since this is my 35th birthday, not my 5th, I decided to “adult” it up for my party by serving a Dirty Shirley. Here is a great recipe from The Solstice Table. For an appetizer try this tropical bruschetta. For the main course I will be serving Kahlua pork, coconut rice, and Hawaiian mac salad. For Dessert try coconut cream pie shooters or a gorgeous coconut cake like this one. Check out these adorable invitations from Carlson and Co on Etsy. This entry was posted in Adult Party, Bridal & Baby Shower, Child Party, D.I.Y., D.I.Y. & Honey Do, Drinks, Let's Party, Open House, Savory, Sweet, Wanna Be Foodie, Weddings and tagged 35th birthday, balloon arch, dirty shirley, flamingo party, lets flamingle, party ideas, pineapple party, tropical party on July 14, 2016 by Sarah. I had dreams of grandeur while preparing to make Tres Leches for my work “Cinco De Mayo” pot luck. I did the research. I had mentally prepared to separate egg whites from their yolks. I was ready to beat egg whites into stiff peaks. I was going to make the best damn Tres Leches anyone had ever tasted. But then I got stuck in really bad rush hour traffic, got home late, realized I need to go to the grocery store before I could make dinner. I had a toddler saying “mom, mom, MOM” in increasing volume while begging for snacks that I knew would inevitably ruin his appetite for dinner. And so in about the length of time it took Oliver Jack to get through his 3rd chorus of “mom, mom MOOOOOOOM” I let go of my dreams of grandeur and got real. It was not going to happen. But I couldn’t show up to work empty handed. While throwing a handful of Pirate Booty in my little crooners direction, I googled “tres leches + pound cake” just to make sure it was a viable substitution. All while contemplating whether Pirate Booty counted as a vegetable?! With very little encouragement I was running out the door to the store. Cut each pound cake loaf in half lengthwise. Place bottom of each loaf in transportable container or lipped serving dish. Using fork, poke holes throughout layer of cake. Combine sweetened condensed milk, evaporated milk, and heavy cream in an easy to pour container. Then pour half of milk mixture over prepared pound cake. Place top layer of pound cake loafs on top and poke holes throughout layer with a fork. Pour the remaining milk mixture over top being sure to get the corners and edges. If there seems to be a lot of the milk mixture pooling in the bottom you don’t have to use all of the milk mixture. Refrigerate for at least an hour or overnight. Top with whipped topping and maraschino cherries. I was surprised with how well this turned out and I have since made this recipe 5 times. The correlation between how easy it is and it’s deliciousness is totally bonkers. Nothing this easy should taste this good. I hope you enjoy! This entry was posted in Sweet, Wanna Be Foodie and tagged 4th of July recipe, cinco de mayo, pot luck recipe, quick easy dessert recipe, tres leches on July 1, 2016 by Sarah. There are two type of peoples on vacation; the “do-ers” and the “chill-ers.” I almost always fall into the first category. I am a planner! I do my research and pack in as much as humanly possible in the time I have. This method is great in that I get to see a ton in a short period of time, but this method also ensures exhaustion and I ultimately need a vacation from my vacation. When planning our Honeymoon my new husband we wanted a “chill” vacation to recover from the stresses of wedding planning. I swear we looked into all 196 countries in the world, or at least it felt that way. We finally settled on the Dutch Caribbean island of Curacao. Just off the coast of Venezuela. With gorgeous white sandy beaches and turquoise water, we found our own little piece of paradise. Our first night in Curacao. After about 3 days of relaxing by the pool, reading, drinking pina coladas, trying to make a baby, swimming, snorkeling, and napping, I started to feel restless. Like I said, I am a do-er. So we took a very expensive cab ride to the capital city of Willemstad and spent the day just wondering around , checking out their markets, amazed at the largess of coming and going cruise ships, & taking in a little graffiti art. We then spent another day lounging on the beach, snorkeling, reading, drinking pina-colada, and trying to make a baby. At some point each day I’d find my way to the resorts little cafe and get a chocolate croissant. For weeks afterward I had the thought, today would be so much better with a chocolate croissant and a pina colada! I really wanted to see more of the Island so we got brave and rented a car. Freak out moment when I realized It was my first time driving in a foreign country. Its a good thing cars work just about the same everywhere. With map in hand my hubby took his position in the co-pilot seat and were headed out. I didn’t follow his directions exactly, took the wrong turn, and we ended up on a very lonely dirt road. It was frightening and exciting at the same time. After a few hushed, muffled curses from Juice, some intense scrutiny of the map, and what seemed like an eternity we made it back on the correct road to Westpunt. I like to look back on this adventure as a relationship building exercise. High on the cliffs of Wespunt we had lunch with a goat. I cant say for sure how many meals this goat has shared with other humans, but it was definitely a first for us. We even came across a flamingo sanctuary on our way back to our hotel. Being the doer that I am, we were lucky to have our own local tour guide for a day. My friend Matt’s mom actually lived in Curacao for many years and knew all the cool local places to take us. Mary was a total riot, she took us to a local grocery store for goodies and beer, we went snorkeling at a couple beaches and we got to check out this crazy cool fort. Fort Beekenburg, built in 1703…is a surprisingly stout structure. Curacao was the first place I have ever snorkeled. Curacao was a great compromise for both the”do-er” and “chiller” in our relationship. My hubby got days of white sandy beaches and reading, I got chocolate croissants, pina coladas, and just enough adventures to keep from going stir crazy. Oh and we both got the cutest baby exactly 40 weeks later. Curacao will always be such a special place in my heart, it was our own little tropical dream come true. This entry was posted in Travel and tagged carribean, curacao, dutch carribean, honeymoon, tropical island, vacation, westpunt on June 29, 2016 by Sarah. Some call it a drip cake, others a drizzle cake, I like to call it a “drip drizzle cake, I must be conjuring up my inner Snoop Dog. Whatever its name, I am completely obsessed. Im loving all the crazy toppings; donuts, Japanese pocky, bon bons, macaroons, flowers, lollipops, fruit, marshmallow, meringue, cookies, truffles, candy, or mini bottles of Jack, the possibilities are endless. I’m definitely going to have a drip drizzle cake for my upcoming 35th birthday. Now how to pick a design?! I hope I didn’t make you too hungry with this post. This entry was posted in Adult Party, Bridal & Baby Shower, Child Party, Let's Party, Open House, Sweet, Wanna Be Foodie, Weddings and tagged Australian cake design, birthday cake, cake design, drip cake, drip drizzle, drizzle cake, macaroon cake, modern cake on June 20, 2016 by Sarah.